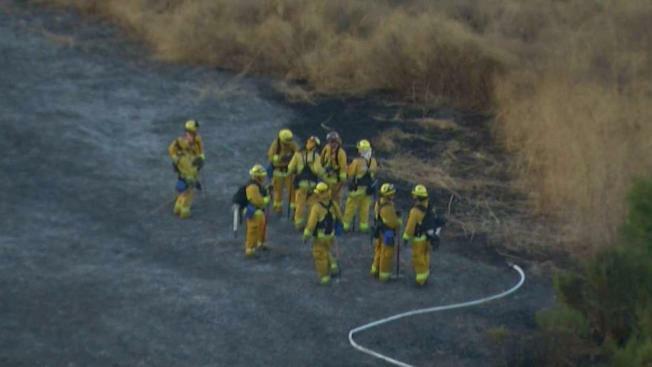 Fire crews knocked down a brush fire Monday evening on Communications Hill, near Curtner Avenue and Monterey Road in South San Jose, according to the San Jose Fire Department. Firefighters were battling the blaze from the ground and air. It started a little before 7 p.m. and spread to 10 acres before crews had it contained, San Jose fire Chief Curtis Jacobson said. No structrures were threatened. Cal Fire was on the scene assisting with the firefight with water and retardant drops, Jacobson said. It was not clear what caused the blaze to ignite, but Jacobson said it doesn't appear to be suspicious.